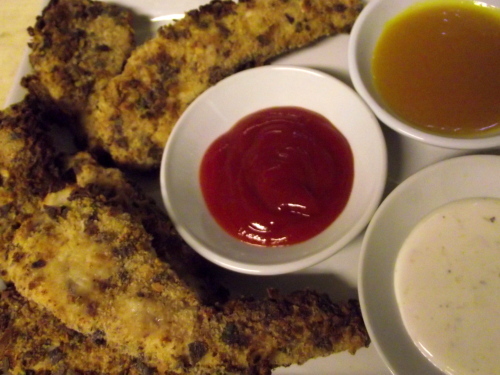 This recipe is a very healthy (baked, not fried) version of a kids all time favorite, chicken fingers, and is a terrific one because it’s easy enough to let the little ones help. You may not want your kids handling raw chicken but they can certainly help with the breading or egg mixture. I like to add the tortilla chips just for additional flavor & texture (in this photo I had used blue chips) but they’re totally optional- I just happened to have them on hand. Also- remember to play around with dipping sauces as they make the meal fun so the more the merrier! After your chicken is sliced, pat it dry and season it lightly with salt & pepper. Beat the eggs together with a splash of either water or milk and them set up your breading station. One bowl with the flour, 1 bowl with the beaten eggs, and another with the bread crumbs. **Optional seasoning can be added to the bread crumbs at this point- a pinch of garlic powder or a tsp of chopped parsley or even a pinch of chili powder if your kids like a little kick. One at a time coat the chicken slices with the flour, then with the egg and then finally, coat them thoroughly with the bread crumbs. Place the breaded chicken finger pieces on a foil lined baking sheet and bake until crispy and brown 18-23 minutes depending on thickness.